Yesterday’s News is a series of public billboards around the city of Vancouver, Canada, by artists reworking old press photographs. Part of the Capture Photography Festival 2018. April 3, 6-8pm. doors open at 5pm. Old news photographs, rescued and re-presented on commercial billboards. One form of public address presented in the context of another. Journalism in the space of advertising. The past in the space of the present. In recent years, many artists and curators have been reconsidering archival news images. These photographic prints—usually black and white, 8” x 10” in size—are historical fragments from the last century. They are also remnants of near-obsolete procedures of taking, making, distributing, and viewing photography as “news.” A photographer would go out and shoot something newsworthy. The film would be processed in a lab by technicians. Frames would be chosen by an editor, and printed. Working with paint and brush, a skilled retoucher would enhance the image so that it looked good and legible in the crude halftone of newsprint. An art director would indicate, with ruled lines in red or white, which part of the image was to be used. Caption information would be added, usually to the back of the print, along with the date, sometimes the photographer’s name, and a photo agency rubber stamp. Very often, all this would happen within a few hours. News decisions are made fast. After it had appeared in the daily news, the image would then enter the archive of the newspaper or photo agency for reference or for a potential further use. Unlike contemporary digital press photography, which is really immaterial data, these images are objects—tactile things bearing the varied marks of the human labour that produced them. Over the last decade, hundreds of thousands of these news images, and many of the original negatives, have been dumped for sale online, to be bought for just a few dollars each, by whoever wants them. As newspapers struggle to survive or find ways to pay off their debts, the photographs in the archive are the first casualties. The few famous images sell for substantially more, and some whole news archives have been saved. Whatever their fate, these photographic materials are finding themselves in new contexts, to be rethought by artists, acquired by collectors, studied by historians, and exhibited by curators. For the 2018 Capture Photography Festival, I have invited the participation of three very different and renowned artists who each have their own long-standing interest in press photography. Each has been asked to present his projects on public billboards situated along Vancouver’s Arbutus Greenway and outside the Grey Church Collection and Project Space on Fraser Street. Thomas Ruff, from Germany, first appropriated news photographs for his artistic projects back in 1990. He has recently renewed his interest, working on an extended series titled press++ (2015–16). He superimposes the backs and fronts of Cold War–era news pictures. What we see is a montage combining the retouched photograph with its appended texts. Ruff uses digital techniques to combine the recto and verso of these image-objects, returning us, momentarily, to an older era of photographic production and consumption. 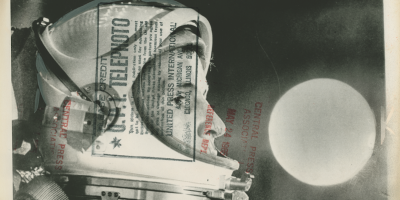 That distant yet familiar world of 1950s and ’60s paranoia, the bomb, and utopian space exploration was also the world of photographic darkrooms and crude propaganda. The Canadian artist Jonah Samson weaves together new narratives and allegories from old images. Often his work involves complex sequences and groupings, but for Capture he is using just one photograph, presented two ways under one title: Why hasn’t everything disappeared already?(2018). It is a kitschy but enigmatic studio shot of a woman dressed as a cowgirl, winking at the camera and pointing her pistol at a white sheet of card. Samson has worked not from a print but from the original celluloid negative. On twinned billboard sites, viewers see both the positive and negative versions of the image. Black and white, white and black. Stanley Wolukau-Wanambwa, who is based in New York, has evolved a practice that integrates reprinted news images with his own lyric documentary photographs, weaving complex and poetic meanings from shared history and individual memory, under the title All My Gone Life (2017). Like Samson, Wolukau-Wanambwa has worked from negatives for twinned billboard sites. He pairs two images that on the surface seem utterly familiar, coming from somewhere deep in the collective memory. A troupe of energetic cheerleaders go through their routine for a photographer and are caught mid-jump, and mouths agape, by the camera’s flash. A bride and groom pose on their wedding day, he placing token food in her mouth. Brought together, the rituals and intimacies of the two images begin to affect each other in unpredictable ways. Placing these images so publicly on billboards only serves to further estrange what should really be little more than worn-out clichés. The images rescued by these artists, and to some extent the anonymous people that these images depict, are like orphans plucked from obscurity. They bring urgent news in languages we can hardly decipher but easily misread. Perhaps even they themselves no longer quite know what it was they wished to communicate. In the end, all images are enigmatic. That is their essential condition. The camera always captures more than anyone wants, more than anyone could be held responsible for. Of course, it rarely seems that way. As soon as photography had been invented, steps were taken to contain its enigmas: the explanatory and reassuring caption, the instructive sequence, the album, the forced laws of genre. But none of these containments hold fast forever. Eventually a photograph works itself loose and even the simplest, most functional document will burst wide open.